Now Accepting 2019 Nomination Applications! Now Accepting Nomination Applications for our 2019 Award Recipients! Recipients will be honored at the 2019 Annual Awards Dinner on Thursday, January 24th at Knights of Columbus. Click here for Nomination Application! Community Service Award – Recognizes an individual that has contributed significantly to the community; serving selflessly without intent for personal or monetary gain. Educator of the Year – Recognizes a teacher in the Batesville Community who has distinguished themselves through exceptional accomplishments within educational and community environments. The annual Tree Lighting and Holiday Parade will take place on Friday, November 30. Bring the whole family to downtown Batesville and enjoy the tree lighting, Santa and his reindeer, festive music, carriage rides, Elfie Selfies, vendors and more. The new route for the parade begins at George and Elm Streets and ends at the Bike Park where the tree lighting will take place. The event is held in conjunction with the City of Batesville, Batesville Main Street and the Batesville Area Chamber of Commerce. Parade Forms are available HERE! 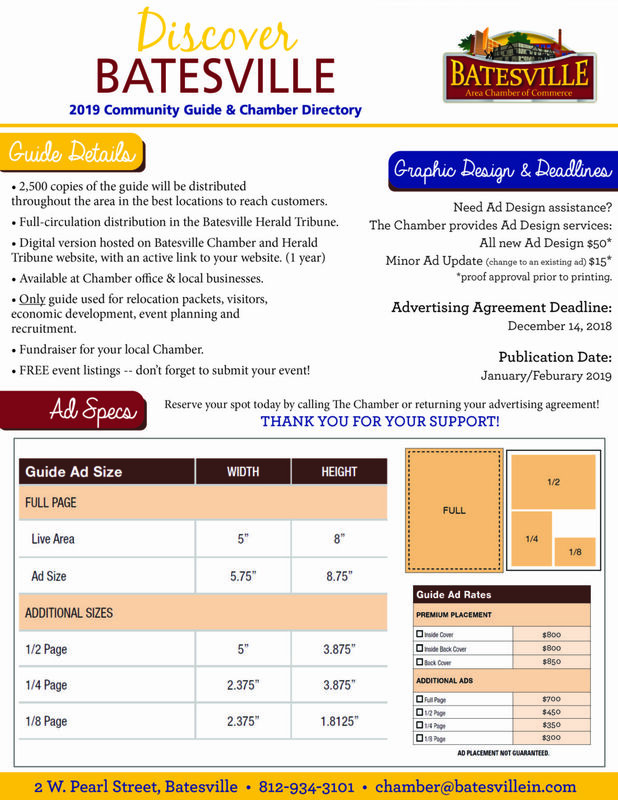 It’s time again for our Annual Discover Batesville Community Guide & Chamber Directory! Your business doesn’t want to miss this opportunity to advertise and SHARE YOUR EVENTS!! Send us your 2019 events by December 14th! For more information regarding our printed directory – check out the Spec Sheet Here! Click here for the Advertising Agreement! 2018 Batesville Bash Feedback Survey! In order to make the Batesville Bash as successful and enjoyable as possible, we need your candid feedback! 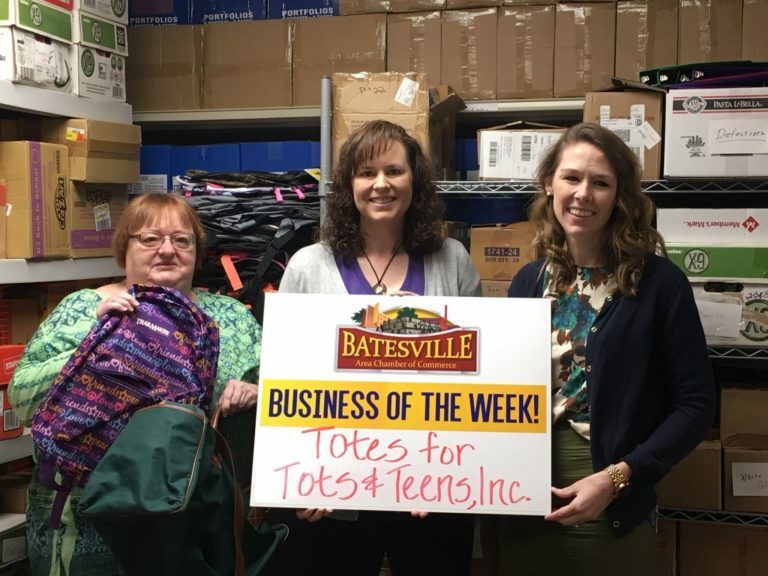 Batesville is a wonderful community, and it’s our mission to continually improve where it’s needed. We want Batesville residents and visitors alike to feel welcome, and enjoy our “Small Town City”. Please take a moment to participate in our survey and help us make a difference! You may take the survey by clicking HERE. Thank you in advance and we hope to see you next year for the 8th Annual Batesville Bash! Cruise in and show off your custom cars and hot rods on Saturday, August 4th in conjunction with the Batesville Bash! The 7th Annual Chamber Car Cruise-In will be from 11am – 3pm, downtown Batesville, in the parking lot between Total Tech Connection & Ken’s Auto Repair. No entry fee — Dash Plaques — Split-the-Pot — Door Prizes — People’s Choice Award — Beer & Wine Gardens — Food Vendors — Live Music — KidsZone & Much More! Discover Batesville during the 7th Annual Batesville Bash! Something for everyone can be found at the Bash on Saturday, August 4th! The Farmers Market, Velo in the Ville & Breakfast on the square begin at 8. Get tips and tricks with Weber Grill experts during Grillin’ with Gillman at 11. The Food & Vendor Market opens at 11! The Chamber Classic Car Cruise-In from 11-3. At 1 the Salsa Contest and Dancing begins. For the Kids, the Children’s Health Care Kids Zone Fun is from 1-5 with games, and inflatables. The Wine & Beer Gardens open at 4 and The Fastest Kid in Town Race begins at 5. The evening’s main stage entertainment features The YorkRidge Boys @ 5:30pm & Five Lights at 8pm. Bring the family. Join your friends. So much fun in store! 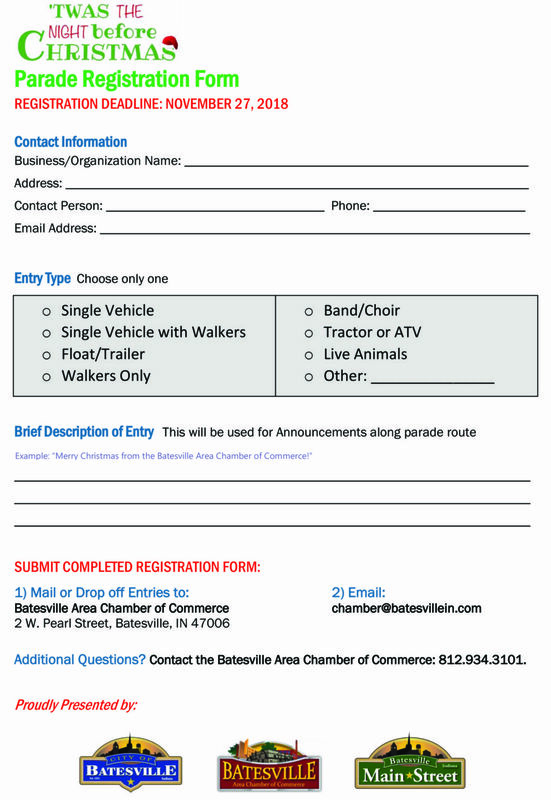 For more information contact the Batesville Chamber – It’s the Batesville Bash – Downtown Batesville – Saturday August 4th! The Batesville Area Chamber of Commerce is gathering candid feedback from our members to help us Build Batesville Better. The results of this survey will be shared with our Board of Directors during our 2019 initiatives Strategic Planning session. *Only those respondents who enter their personal data at the conclusion of the survey will be entered into the drawing for $50 in Chamber Checks. Tri County Networking meets the third Thursday of each month at the Big Four Cafe (Meeting Room) at 8am. We are wanting to grow small businesses, and the only way is by working together. If we all work together it makes are business larger and more profitable. Join us and help grow your business.